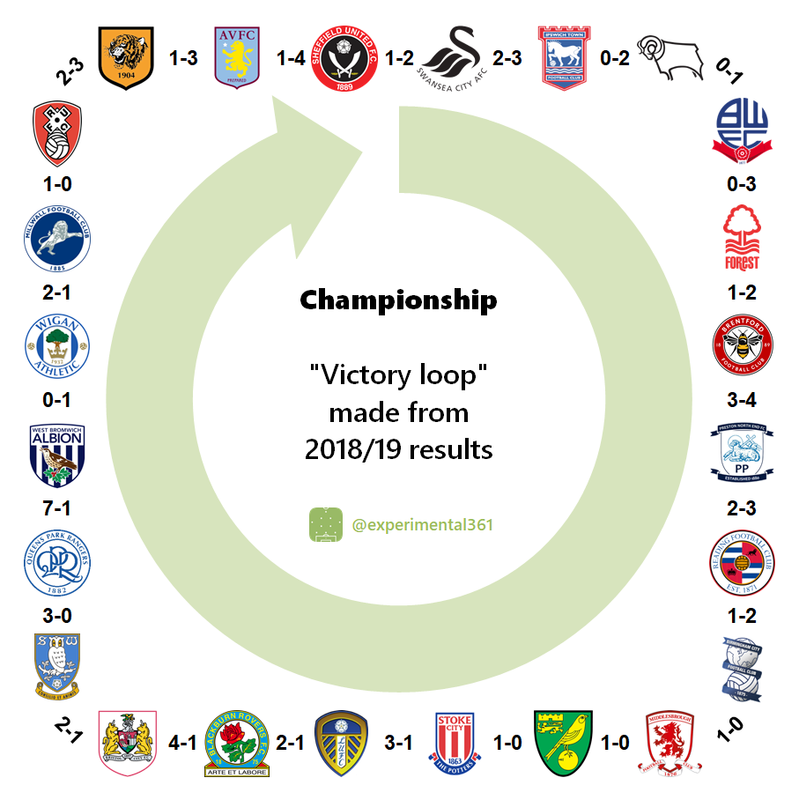 I realised that it was about the stage of the season where it’s worth checking to see whether you can make a continuous loop of “Team 1 beat Team 2 who beat Team 3 etc” including all of the clubs in a division and beginning back where you started … and it turns out you can. Every team in the graphics below has been beaten by the one immediately clockwise of it in a league match this season. This doesn’t necessarily “mean” anything, but it’s reassuring that the EFL divisions are sufficiently open and competitive for this to be possible. So to give an example, starting in the top left corner: Hull lost 3-1 to Aston Villa on the opening day of the season, but Villa were in turn defeated 4-1 by Sheffield United in early September. The Blades themselves went down 2-1 to Swansea in their first match, but the Swans are also Ipswich’s only scalp of the season so far, having lost 3-2 at home in early October. 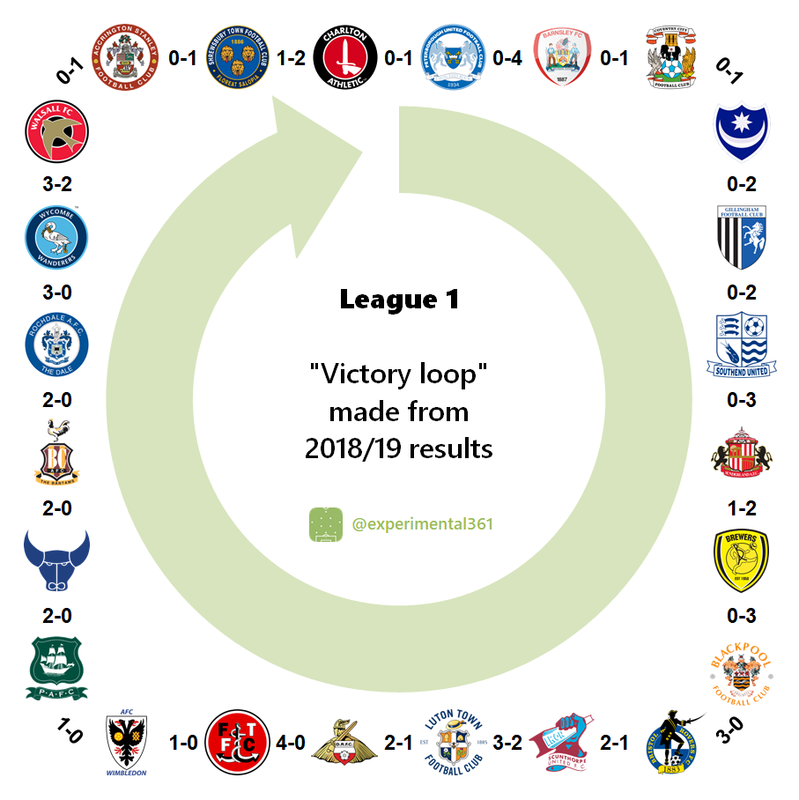 You can follow the pattern all the way through each of the 24 teams in the division, closing the loop with Hull’s 3-2 win at Rotherham in mid-September. I wasn’t sure whether this one would work as both Portsmouth and Sunderland have only lost once each, but fortunately as both went down to teams who’ve suffered a fair few defeats there was a way to link everyone together. 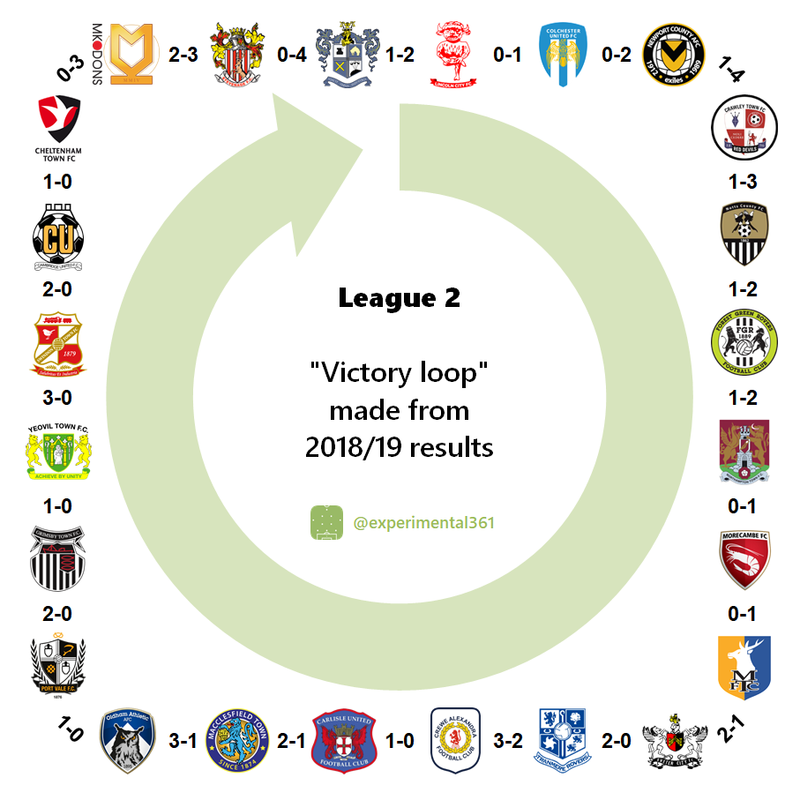 Again with Mansfield having only lost once (to fellow promotion-chasers Exeter) and Macclesfield only recording two wins I was surprise that you can already make a sequence out of League 2 wins, meaning that all three EFL divisions can be looped together in this way. I will try to do a Premier League version, but that’ll have to wait until someone finally beats Liverpool and Man City.